Today its a little different to my previous Tea Tuesdays, today I want to be thankful, Yes I am saying thank you for my love for tea. Recently I have been feeling at times hopelessly alone and when I do I grab the brightest mug I have and put the kettle on. 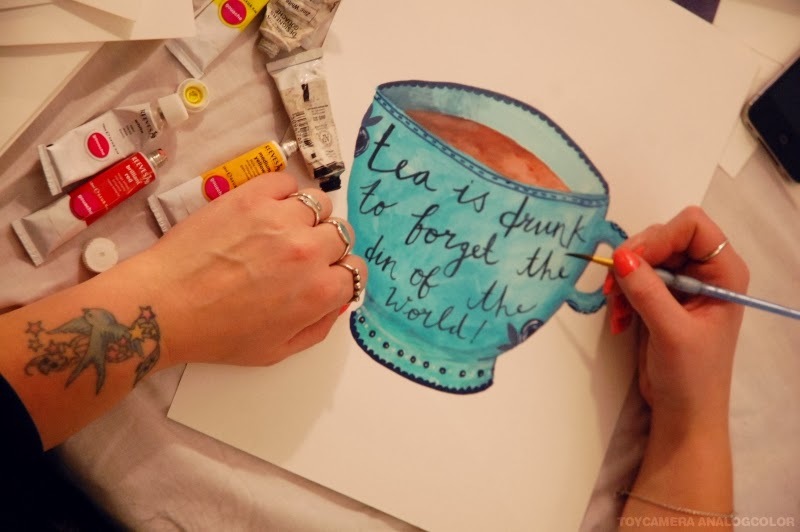 When ever I drink tea, it sends me back to happier times as a child, it is true where there is tea there is hope. Something so simple and probably silly to others is a vital part of my day and my families day. I am thankful for the moments, I take out my day when I am drinking a good cuppa, it allows me to let my mind wander…allows me to create beautiful work. I am thankful for tea and its happiness it brings to me and to others. I am thankful it gives me new ideas for new work for my new stationary company, the painting above is part of a new collection. Last weeks whittards giveaway will be announced on Friday and the winner will be contacted. I'm also thankful for a tea timeout. It creates an aura of zen around me. It also connects me to my grandmother and my years spent living on her farm; sat out on the swinging sofa watching us tend to daily farming life. Beautiful. I love tea! Today I'm thankful for my husband who has been so helpful around the house these past two weeks after I seriously burned my hand. This post really made me stop and think. I too am grateful for tea although I think personally I may be grateful for coffee even more. It is the drink I always have when out with friends and first thing in the morning. It helps me pause, gather my thoughts before moving on to the next thing.